Over the past 2-3 years, my skin has gone from what you saw in the first two pics to this: little red bumps everywhere. My skin is no longer a uniform texture or color. I've been to see a dermatologist twice, and she basically does nothing. She can't even tell me if this is rosacea, contact dermatitis, or mild acne. 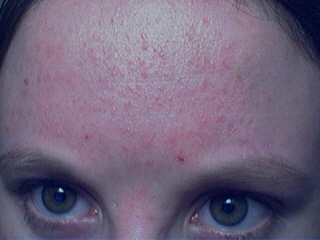 Today (02/19/2006), I got so pissed off I just decided to stop washing my face altogether. I feel ugly. I don't care anymore. please don't give up You are realy hot! don't give up you are really hot!